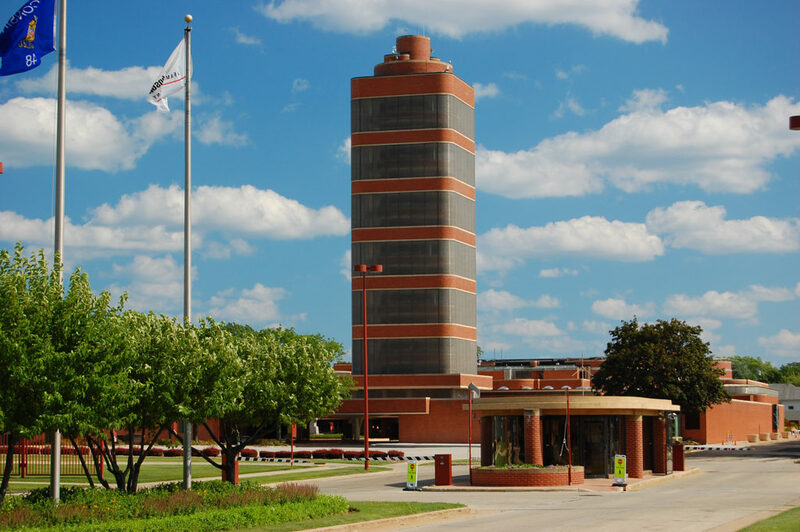 October 1, 1968 –The Chicago City College Board approves a proposal to buy property west of its Loop campus at 64 East Lake Street in order to build a new high-rise campus. The school’s chancellor, Oscar Shabat, says that the school envisions a campus that will rise 25 to 30 stories. The property between 62 and 54 East Lake Street will provide 10,000 square feet of land with a frontage on Lake Street. A key to getting the project started is still to come as the Illinois Junior College Board must approve the new building, and that body is waiting on $170 million that the Illinois Board of Education has recommended. Nothing happens for years, and by the summer of 1974 a report prepared by the office of Mies van der Rohe states that the plan does not appear to be feasible for all kinds of reasons, the most of important of which is the “… deficiency of current plans to integrate the Loop College into the life of the Loop. The site does not offer any special potential to either act as a catalyst for area redevelopment and improvement or to become integrated into the city.” [Chicago Tribune, August 21, 1974] In 1975 a new site is selected for the college in a two-block area between Jackson Boulevard and Congress Street on the west side of State Street, the site on which the Harold Washington Library stands today. 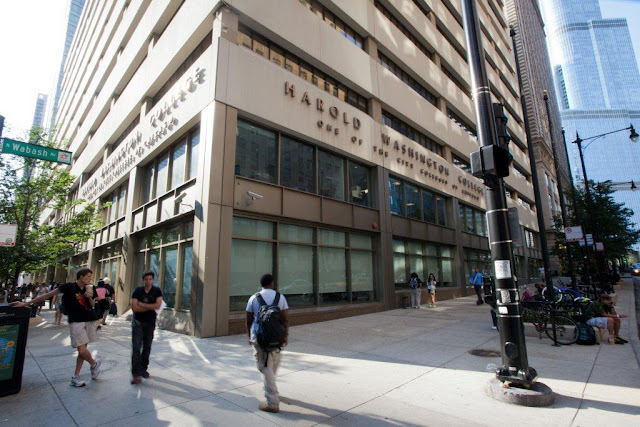 The Chicago City Colleges board began buying land at that location, spending $494,750 for four parcels in the 400 block of South State Street. Two months later Governor James Thompson vetoes a $7.5 million appropriation to buy any additional land for the college. Things drag along until March, 1979 when the trustees of Chicago City Colleges approve a plan to buy an existing 25-story office building across the alley from the original location of the college at 64 East Lake Street. In July of that year Chicago City Colleges begins to move forward with the conversion of the office building at 65 East South Water Street. In that same month the Public Building Commission approves a $14 million renovation of the South Water Street building. The Chicago Tribuneeditorializes, “After years of frustration and of nursing plans too ambitious and too expensive to be realized, Loop College can at last expect to have soon a suitable physical plant.”[Chicago Tribune, July 16, 1979]. Not so fast. 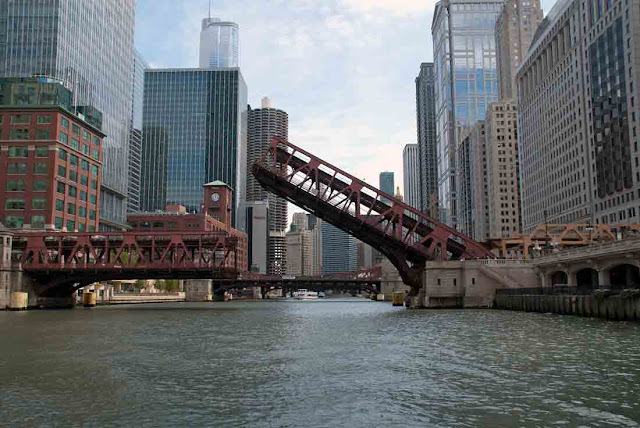 Unable to agree on a price for the building on South Water Street, Chicago City Colleges turns to a condemnation proceeding which pegs the cost of the property at $4,454, 818, a figure Shabat, still the head of the college, calls a little too rich for the college’s blood. Finally, on June 13, 1980 ground is broken for an 11-story, $19.3 million college building at the original site that was purchased in 1968 with completion scheduled in 1982. Shabat says, “I’ve waited 19 years for this day. Now we can go forward.” [Chicago Tribune, June 14, 1980]Mayor Jane Byrne dedicates the new campus on November 13, 1982. On December 1, 1987 the college, with 8,217 students, is renamed Harold Washington College in honor of the Chicago mayor who died in office a month earlier. October 1, 1930 – A thousand people listen to Frank Lloyd Wright discuss architectural trends in Fullerton Hall at the Art Institute of Chicago. According to the Chicago Daily Tribune, “Mr. Wright discussed the use of new materials, including glass and steel in the building of skyscraper homes,” emphasizing “that a home is not made up solely of roof and walls, but is toned and dominated by its interior.” [Chicago Daily Tribune, October 1, 1930] Wright brings an exhibit with him, “a model of a skyscraper built of glass and steel and dwellings of the same materials.” As part of his remarks Wright says, “There must be no conflict between architecture and nature. A building should conform to the contour of its surrounding.” The Johnson Wax Company's headquarters tower in Racine, Wisconsin, shown above, was completed nine years after Wright gave his lecture on glass and steel skyscrapers.